DOWN ON FNY FARM-PKG was written by PATRICK KING. 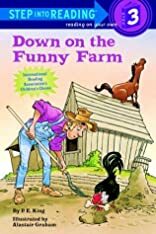 DOWN ON FNY FARM-PKG was published by Random House Books For Young Readers. Subjects of DOWN ON FNY FARM-PKG include Audio: Juvenile, Non-Classifiable, and Nonfiction - General. About PATRICK KING (Author) : PATRICK KING is a published author of children's books. A published credit of PATRICK KING is Down on the Funny Farm (Step-Into-Reading, Step 3).